Meuse-Argonne, September 26-October 1, 1918. The 369th Infantry fought valiantly in the Allied (Champagne) Offensive as part of the French 161st Division. 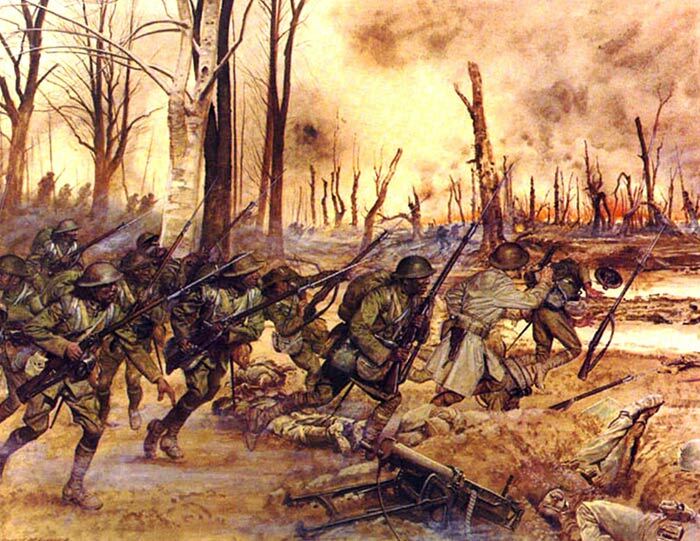 Attacking behind a fiery barrage, the 369th Infantry assaulted successive German trenchlines and captured th town of Ripont. Against determined resistance, the 369th advanced up the heights norths of the Dormoise River and spearheaded the attack toward the town of Sechault. On 29 September, the Regiment ". . . stormed powerful enemy positions, . . . took, after heavy fighting, the town of Sechault; captured prisoners and brought back six cannons and a great number of machine guns." Despite heavy casualties, the 369th, called "Hell Fighters" by the French and Germans, relentlessly continued the attack at dawn. Raked by enemy machine guns, they assaulted into the woods northeast of Sechault, flanking and overwhelming enemy machine gun positions. The "Le's Go!" elan and indomitable fighting spirit of the 369th Infantry was illustrated throughout the battle action. Their initiative, leadership and gallantry won for their entire Regiment the French Croix de Guerre. Under the command of Colonel Hayward, who although wounded, insisted on leading his regiment into combat; of Lieutenant Colonel Pickering, admirably cool and courageous; of Captain Cobb (killed); of Major Spencer (severely wounded); and of Major Little, a real leader of men, the 369th Regiment of American Infantry, under fire for the first time, captured some powerful and energetically defended enemy positions, took the village of Sechault by main force, and brought back six cannon, many machine guns, and a number of prisoners.